Carron Phoenix Seraphina 3-in-1 boiling water kitchen tap in chrome with normal hot and cold water. Seraphina provides normal hot and cold water as well as boiling water (3-in-1). 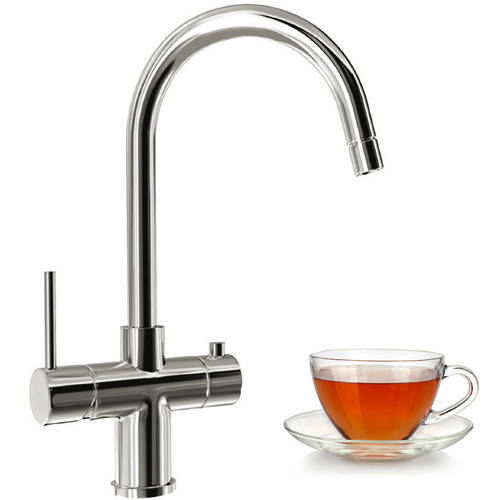 Instant 100°C boiling hot filtered water at the touch of a button (negating the need to wait on the kettle boiling). Why waste electricity and water boiling the kettle when you can have instant boiling water for making coffee, tea, or for cooking on tap? Incorporates a water conditioning filter, ensuring your boiling water is free of sediment and odour and any unwanted particles. 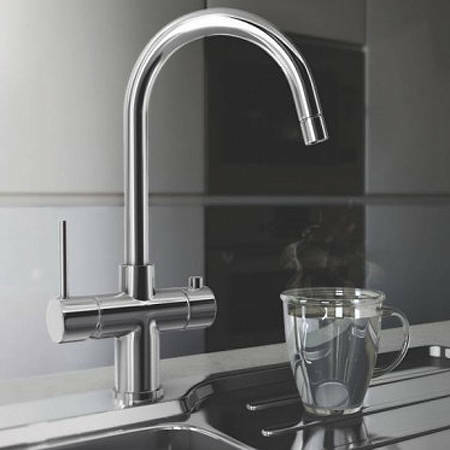 Requires the activation of a safety button to operate the boiling water function, ensuring safety for users. Can be fitted with boiling water control on left or the right side. 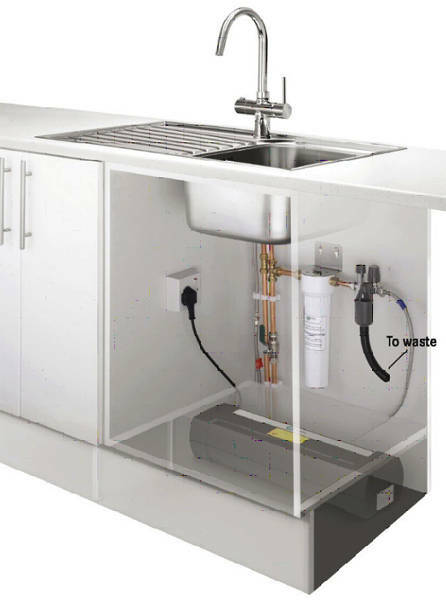 Fit and forget - plug and play, heating tank fits behind standard 150mm kitchen unit plinth (saving space in your unit). Tank size: W550 x D211 x H142 mm. Tap flow rating: 1.5bar + (very high pressure). 5 Year Carron Phoenix guarantee. Carron Phoenix collection offers stylish modern and traditional sinks that will finish your kitchen space to the highest quality standard. Products are manufactured from the finest materials to the latest digital standards and all their sinks come with a full lifetime guarantee. The Carron Phoenix company started doing business in 1759 near the town of Falkirk in Scotland. Famous for manufacturing the iconic red telephone boxes and pillar boxes still in use throughout the UK. Carron Phoenix are now one of the largest manufacturers of exceptional kitchen sinks in Europe today. The Carron Company became a manufacturing power-house, driving the industrial revolution in Scotland to a point where it employed 5000 people, operated it's own fleet of steam ships and even issued its own currency to enable global trading. Carron also made domestic items like flat irons, cast iron baths, range cookers and most famously the Carronade cannons used by Wellington at Waterloo.